We are delighted to announce that this year’s show is sponsored by one of our favourite local hostelries, The Inn on the Green in Horfield, Bristol. 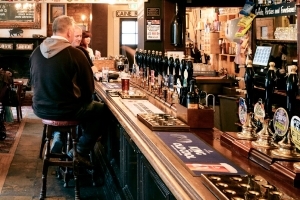 Renowned for its impressive selection of real ales, good food and friendly atmosphere, not forgetting the extensive beer garden and car park (so convenient in Bristol! ), we are always happy to sample an ale or two there with a game of darts after a busy day at the gallery. Proper pub.